You open your mailbox one morning and there inside is a letter from a charity asking for your support. You read it and either toss the material or are inspired to donate, writing out a modest check and popping it in the mail. You feel good knowing that you sacrificed something to support a cause you think is important. But the problem we’re confronting is so much material imploring us to listen it’s a challenge to separate the signal from the noise. “Noise” means… useless information. “Signal” means… truth. Once upon on a time information was scarce. You had to hunt for it, nobody pointed a fire hose at your face, which is what logging onto the internet is like today. It’s a tsunami of information and with your time limited where do you place your attention? As consumers we’re inundated with noise. To the point we ignore almost everything that’s incoming and we only pay attention to our trusted filters who are most often friends. I only have time for incredible and so do you. Which is why I’m raising awareness about the Children’s Cancer Association (CCA). How many charity rides do you participate in a year? If you are like most motorcyclists you probably support a couple a year. It’s not always about the ride; it’s about giving back to your community and helping the incredible non-profit organizations with their cause. 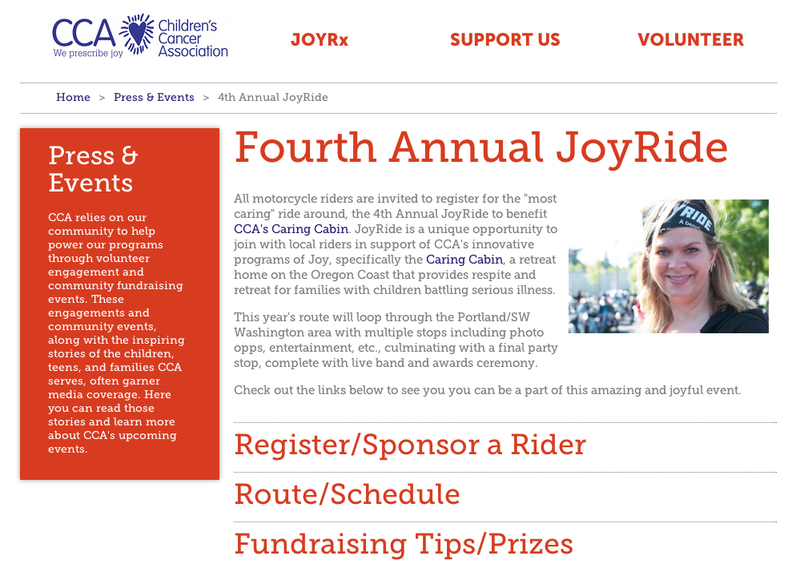 That’s what the 4th annual CCA Joyride is all about. Paradise H-D is a key sponsor of the event to raise funds for The Alexandra Ellis Caring Cabin™. The Caring Cabin provides children and teens facing cancer and terminal illnesses who are in treatment in Oregon, along with their families, an extraordinary place to retreat, relax and create once-in-a-lifetime memories. The Caring Cabin is the only retreat home of its kind in the western U.S. and is on 24 wooded acres near Pacific City. I hope you’ll consider joining the charity ride on Saturday, June 22nd. A new route (HERE) is planned this year that winds through Portland and SW Washington, making stops along the way at some favorite locations. 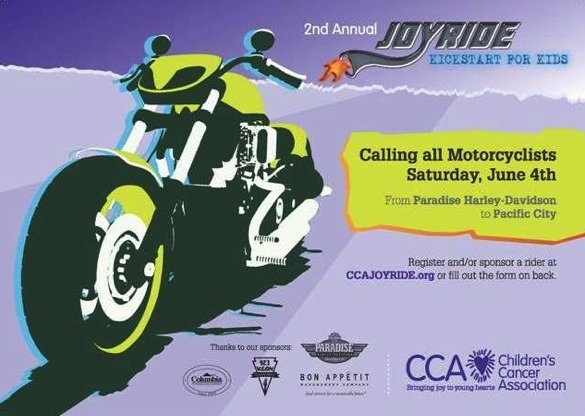 At kick-off, riders will receive a JoyRide Passport that will guide them to each location and where they will learn more about CCA along the way. Each stop will feature beverages, giveaways, and opportunities to interact with CCA volunteers or families. Riders who visit all of the stops will be entered into a drawing for a Grand Prize. You can register HERE or if unable to attend the ride you can sponsor a rider HERE. 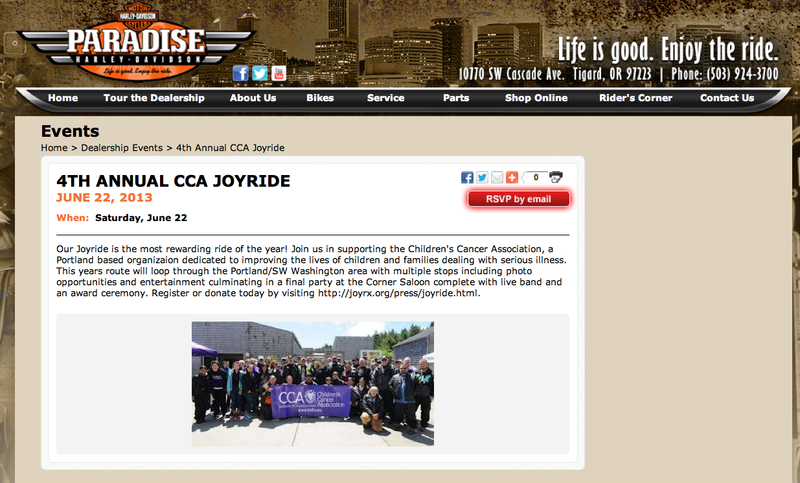 There will be an award’s ceremony at the Corner Saloon which is the final stop of the CCA Joyride. Photo courtesy of Paradise H-D and CCA Joyride. We get them all the time. They are often ignored. It goes something like… bring canned goods to the post office. Or a notice in your inbox as it swells up with requests. As people talk up a cause, send Facebook requests and use testimonials to solicit your participation and ask that you give. In the northwest, charity events ranging from runs, to bicycle events to climbing Mt. Hood all start ramping up in the spring. Even motorcycle enthusiasts are called to participate in various charity rides. Sure motorcycle charity rides can be something of a grind at times. The days start early, there can be dicey weather, the routes can be stressful and fuel stops can be chaotic. But, that’s why on Saturday, June 4th it will be a genuine treat to join Mike Durbin (Paradise H-D) for the 2nd annual CCA Joyride which supports the Children’s Cancer Association. Most everyone likes to help out where there is a need and this is especially true when it comes to children who can’t help themselves. The ride will start at Paradise H-D (Tigard) and take off for Pacific City on the coast at 10am. I hope you’ll consider joining this charity ride which has great Oregon scenery and is well organized by the pro’s at Paradise H-D. Besides. Riding for a good cause just makes you smile! Photo courtesy of CCA Joyride.